Tammy entered foster care when she was 13 years old but chose to go out on her own when she turned 18. Because of the scars she carried from past abuse and early childhood traumas, she struggled to further her education, find employment and become involved in healthy relationships. Fortunately, Tammy recognized that she needed help and decided to move to The Faine House where she could live in safe and affordable housing. This allowed her to continue her education and find employment. Last summer, she became a Certified Nursing Assistant and works full time at an assisted living facility. And by the end of this year, she will complete the Culinary Program at Orlando Tech. 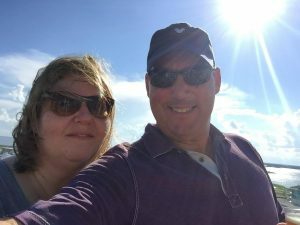 During this time, Tammy saved her paychecks as well as the funds she earned through WingsNet and was able to purchase her first car. Congratulations, Tammy, keep up the good work! Don’t forget that our Matching Gift program continues through the end of 2016 — all donations will be matched dollar for dollar. This campaign will ensure our WingsNet program can continue to impact the at-risk youth aging out of foster care. For more information about our WingsNet program and the impact it has on youth who have aged out of foster care, visit our donation page. Remember that all donors will be entered into a drawing for a $100 Amazon gift card! Thanks to everyone who participated in our FaceBook Gala Weekend on September 30! And congratulations to Cheryl and George Distler who received the most “likes” for their photo! 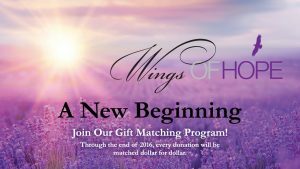 Although Cheryl and George won the $100 Amazon Gift Card, they showed their true winning spirit by turning the gift card back to Wings of Hope so more youth could be assisted! Thanks, Cheryl and George! We are grateful for all the wonderful, generous, compassionate supporters who have come together to make a difference in the lives of at-risk youth. Each of you will be counted among our many blessings this Thanksgiving Season. May God bless you and your families.